EuroGeo6 Congress is relocated without changing the congress dates. New destination is Ljubljana, Slovenia. Professionals and students around the world will follow for the first time by ITAFEC’s online platform this European conference held in Spain. 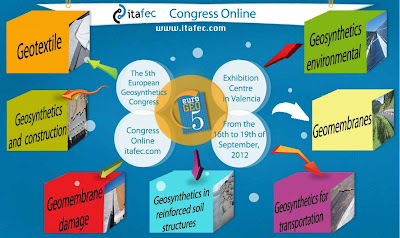 From the 16th to 19th of September, 2012, Valencia will be the host of EuroGeo5, the 5th European Geosynthetics Congress organized by the Spanish Chapter of the International Geosynthetics Society (IGS) and with the collaboration of other institutions, both public and private. 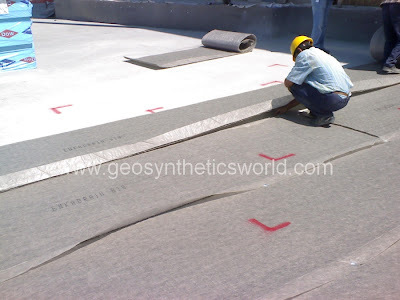 Due to the success of previous congresses, this fifth congress seeks to become an international benchmark forum on recent developments in the field of Geosynthetics. Opportunities for hands-on participation by the attending technicians with respect to the communication technology contributions are expected at this event. These sessions could be followed for the first time by the ITAFEC’s online platform (Institute of Advanced Techniques for Trade Shows, Events and Conferences, by the Spanish acronym). The online diffusion is available in ITAFEC’s web (http://www.itafec.com/). The online inscription for all interested people who wish to assist to all programme of Auditorium 1A: the price is 250 euros (200 euros to IGS members). 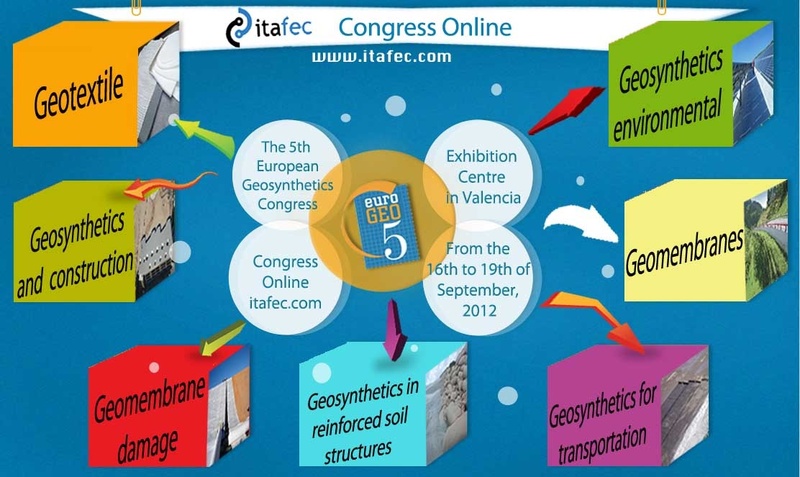 With this offer, the organization opens the possibility of spreading internationally and also available to the public the latest information through their social networks: Twitter (@CongresoEurogeo) and Facebook (http://www.facebook.com/pages/Congreso-Eurogeo5/377787792233148?ref=hl). ITAFEC, Institute of Advanced Techniques for Trade Shows, Events and Conferences, is a young initiative focused on the development of new communication technologies, primarily in online format, for use in conferences, seminars, fairs and specialized. The online betting retransmission Eurogeo5 Congress by the Spanish Chapter of International Geosynthetics Society (IGS) emphasizes its informative purpose of this sector, which takes place through actions such as conferences and symposia and technical and policy information. 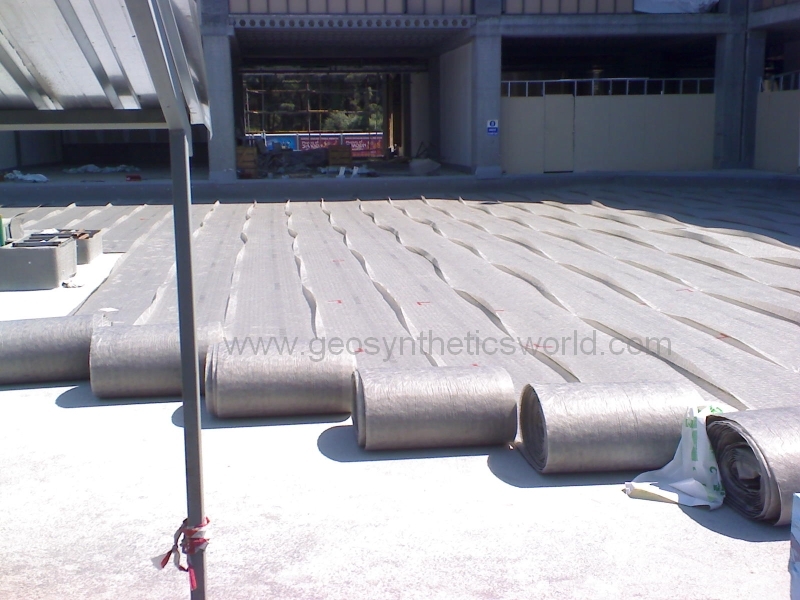 Laying geocomposite drainage sheets at the roof garden of a shopping mall construction. Special attention should be given to to direction of overlap considereng the backfill direction. "The expansion of Leister USA is paramount in our effort to better service the U.S. Market," stated Jerry Zybko, general manager, Leister USA. "This is the first step in our commitment to the U.S. Geo industry," reports Steve Hobbs, business development manager of Leister USA's Geosynthetics Division. "We're ramping up our customer service and support network to assure a positive experience from start to finish with Leister tools," explained Hobbs. In addition, Leister continues to expand and refine its Geosynthetics tool offerings. 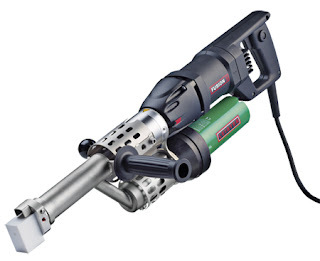 The newest addition is the FUSION 3 extrusion welder with 5 mm rod feed, an inexpensive solution to medium output extrusion welding. Stay tuned for additional news about Leister's exciting growth in the U.S. Geo market. For details, contact your Leister distributor toll-free: 855-Leister (855-534-7839); via email: geosynthetics@leisterusa.com; or visit their website: www.leisterusa.com. Leister Process Technologies (www.Leister.com) has been the worldwide leader in plastic welding and hot air equipment for more than 60 years. The Swiss manufacturer's plastic welding products are used in roof-sealing systems, floor coverings, plastic sheeting, earthworks, hydraulic and tunnel engineering, process-equipment manufacturing and vehicle repair. Leister, with headquarters in Kägiswil, Switzerland, and sales and service centers in more than 90 countries, is ISO 9001 certified. To guarantee maximum quality, Leister develops and produces all its products and accessories (more than 10,000 items) on its own state-of-the-art manufacturing premises. Leister USA (www.LeisterUSA.com), located outside Chicago, is a business unit of Leister Process Technologies and is the primary U.S. sales and service support center for Leister's full line of products including process heat and plastic welding equipment, lasersystems and microsystems. Leister USA boasts a wide network of distribution partners across the United States and Canada. A nice video animation to show how to install gabion baskets on geotextile fabrics. 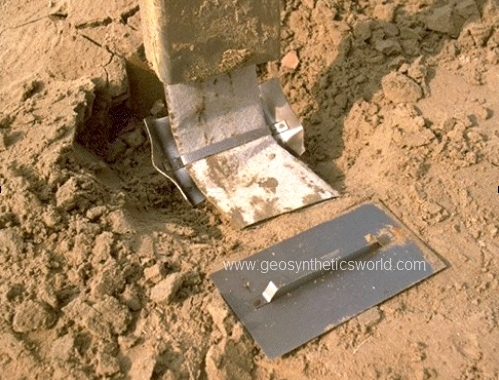 During the installation of prefabricated wick drains (Prefabricated vertical drains) for soil consolidation you need some materials under the mandrel (lance) to hold the drain in the soil when you pull the mandril back. 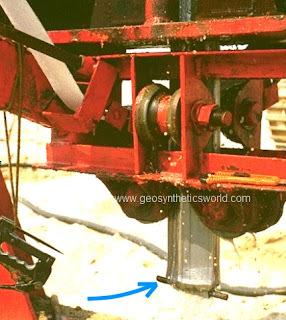 So you have to use anchor plates or anchor rods. Both is OK depending on site conditions. I find the plate more easy to use. When the mandril is pushed in the soil the plate holds the drain in the soil.